This item is an image. It was created by an unknown creator on or around the date time period: ca. 1917-1918. 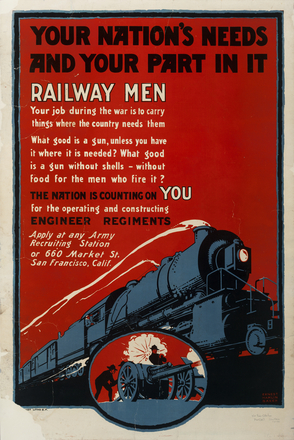 Poster produced during the First World War by the United States Army, in an attempt to recruit railway workers for service with the Engineer Regiments. Illustration of a black and blue train, on a red background, and a smaller illustration of two men operating a Howitzer, or similar. Text "Railway men your job during the war is to carry things where the country needs them ... the nation is counting on you for the operating and constructing engineer regiments. Apply at any Army Recruiting Station or 660 Market St. San Francisco, Calif.".